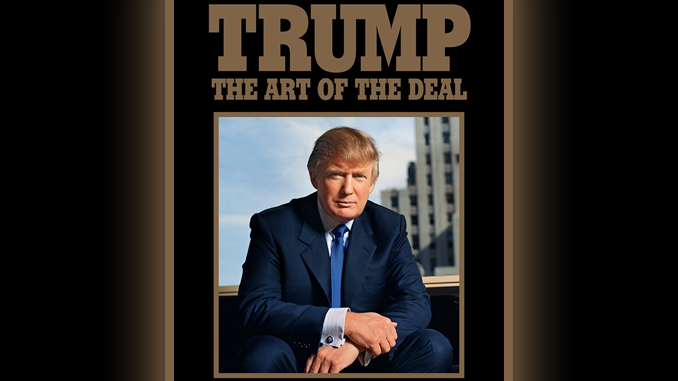 Art of the Deal. Donald J. Trump. Trump: Give me money for the WALL! Trump: Give me money for the WALL or I’ll shut down the government! Trump: Give me money for the WALL or I won’t reopen the government. Trump: Give me money for the WALL or I will blame the government shutdown on you! Trump: Give me money for the WALL or I’ll make you look bad during my State of the Union address! Pelosi: No. And you can’t give it in my House. Trump: Give me money for the WALL or I’ll declare an EMERGENCY! Trump: Give me money for the WALL or I will REALLY, REALLY declare an EMERGENCY, because I can if I want to! Trump: Give me money for the WALL and I’ll give you DACA for three years, or else I’ll declare an EMERGENCY! Trump: Give me money for the WALL or I’ll tell everyone you don’t care about national security. And YES, I will be giving my State of the Union address at your House. Pelosi: No. And no you won’t. Trump: Give me money for the WALL and, fine, I’ll wait to give my State of the Union address until you say it’s okay. Pelosi: No money for the wall. Open the government, then we will talk. Trump: Give me money for the WALL or I will NEVER open the government or will declare an EMERGENCY. I mean it this time! Trump: Okay, I’ll open the government, but you better give me the money for the WALL within three weeks or I will REALLY, REALLY, REALLY declare an EMERGENCY! Trump to the American People: GREAT news! We have reached a DEAL to reopen the government!